and that the navy should refrain from placing orders at the Sun yard.6In return, the maritime commission was to place no contracts with Newport News, New York Shipbuilding, the Bethlehem yards at Fore River, San Francisco, and Staten Island. 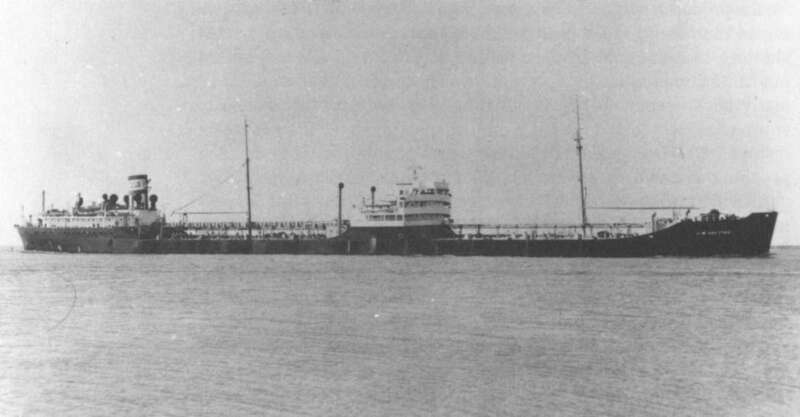 Assigning Sun Ship to the maritime commission formed the basis for the commission's wartime tanker program. At the time, Sun's eight shipbuilding ways were fully occupied constructing private tankers. Admiral Land realized the company had the staff to manage a larger yard, however, and a twelve-way addition, paid for and owned by the government, was built along the Delaware River to handle government contracts. In March 1942, three additional yards were turned over to the exclusive construction of tankers. These were the new Kaiser Company ship yard at Swan Island, Oregon; the Alabama Dry Dock and Shipbuilding yard at Mobile; and the Marinship yard in Marin, California. Funding for still more ships was provided by the Defense Aid Supplemental Appropriation Act, better known as the "Lend Lease Act. "7 Approved by Congress on 27 March 1941, the act provided Roosevelt with a legal way to aid Britain by allocating another $550 million to the maritime commission for the construction of large numbers of merchant ships that could be transferred to Great Britain in return for territory leased to the United States. After the act was passed, Roosevelt called upon Admiral Land to advise him as to how funds for yet another two hundred ships should be allocated.8 Land, who had never favored the slower Liberty design, successfully urged that at least half of the vessels be the faster C-types originally developed for the commission's long-range program. The construction of tankers had not been contemplated in the original plans, but heavy losses in this type (twenty-two British tankers were sunk during the period January-March 1941) convinced Roosevelt to add a large number of tankers to the list of ships needed. These were included in the emergency shipbuilding program formally announced by the president on 19 April. Thus, when the president's lend-lease program of emergency shipbuilding was formally announced on 19 April 1942, it included seventy-two tankers, which were allocated to Sun Shipbuilding and Dry Dock Company as part of a total program that now numbered 306 vessels. Although turboelectric drive was a new development, Sun was familiar with it, having previously built the electric-drive tankers J. W. Van Dyke and Robert H. Colley for the Atlantic Refining Company.12The decision to employ turboelectric drive was forced upon the maritime commission as a result of the tremendous increase in shipbuilding, which occurred as both the navy and the maritime commission awarded hundreds of contracts for new ships. By the spring of 1941 the industry was filled to capacity with back orders and further expansion was proving difficult due to a growing shortage of machine tools. Substitution of turboelectric drive solved the potential delay in engine deliveries by circumventing the need for the reduction gears--then the tightest bottleneck in engine production.13 The foresight demonstrated by the commission in this regard was to provide important dividends for the navy when the commission's tankers were needed on an emergency basis to fill the shortage in fleet oilers that arose in the first months of World War II. One other change was made to the original design: the traditional parabolic sheer of the upper deck was eliminated in favor of an increase in the molded depth.14 This change simplified construction and was another feature adopted from the design of the Atlantic Refining vessels. Length, between perpendiculars 503' 0"
Draft, molded design 29' 113/8"
1 T2-SE-A3 had been delivered making the T2 the largest single class of tankers ever built. Welding permitted them to be built in the shortest possible amount of time--so fast that the world's record for tanker construction is still held by the Marinship Yard for a T2-SE-A1, Huntington Hills, which was constructed in just twenty-eight days (on the ways)!